Emirates, one of the world’s largest international carriers is planning to start a new daily service to Orlando, Florida, its 10th city in the US. The Dubai-based airline also announced a doubling of capacity on its flights to Seattle, Washington, by adding a second daily flight to the route beginning on July 1 as part of its long-term plan to fly to 20 destinations in the United States. The new daily service between Orlando International Airport and Dubai is slated to start on September 1 and will be served by Boeing 777-200LR planes. Each plane can carry 266 people including eight private first class suites, 42 business class and another 216 economy seats. The flight will be equipped with individual passenger-entertainment systems that feature more than 2,000 channels. 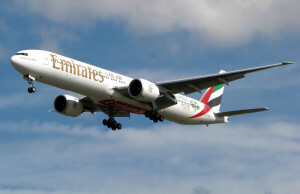 Emirates Airline, the largest carrier in the Middle East, currently operates three daily flights between Dubai and New York, and has another daily flight between Milan and New York. It also flies daily to Chicago, Dallas, Boston, Houston, Los Angeles, Seattle, San Francisco and Washington. Passengers arriving in Orlando will be able to connect to other American cities, the Caribbean and South America via JetBlue Airways which has a regional hub and serves 24 cities from Orlando. Frank Kruppenbacher, chairman of the Greater Orlando Aviation Authority said the new service would bring $100 million impact for Central Florida by opening up the Asian market. However, the three big United States carriers, Delta Air Lines, American Airlines and United Airlines, are lobbying the administration to freeze new flights from the three Persian Gulf carriers, Emirates and Etihad Airways and Qatar Airways. They accuse the Gulf airlines of unfair competition by using government subsidies through so-called “open skies” agreements to finance their global expansion.